The Daniell family were very wealthy mercers and glovers who came to Yeovil in the seventeenth century from East Coker, Gyles Daniell dying there in 1613. His grandson William settled in Yeovil, becoming a well-to-do glover and serving as Warden of Woborn's Almshouse from 1645 to 1647 and as Custos from 1654 to 1655. His son Samuel was also a glover and Custos of the Almshouse, marrying Mary Saunders in 1677. Mary told one of her grandchildren that she remembered seeing William of Orange riding through Yeovil in a red coat on a white horse on his way to take the throne from James II in 1688. Samuel's son, also Samuel, became a mercer and linen draper in Yeovil. This Samuel, who was also the great-grandfather of Peter Daniell of Penn House, was father of John Daniell the elder, also a Yeovil mercer and linen draper who became a merchant banker. John built Hendford House (today's Manor Hotel) in 1776. His younger son, known as John Daniel the Younger was born in Yeovil in 1757 and baptised on 6 October 1757 at the Unitarian Chapel in Vicarage Street. His eldest brother, Samuel, became a banker owning Samuel Daniell & Co which John Daniell the younger eventually took over and the banking business, in premises close to Hendford House, ultimately became known as Yeovil Old Bank. He also inherited Hendford House on the death of his father in 1797. A lease exists, dated 1801, in which George Bragg Prowse of Yeovil, Esq. leased to John Daniell of Yeovil, Esq. the “Capital Mansion House (later known as Kingston Manor House) in Yeovil for 6 years with coach house, stables, offices, courtyard, gardens, orchard and paddock containing 6 acres with household goods, furniture and implements of household in and about the Mansion House as listed in a certain inventory also Home Close and Quarry Close 10 acres, lying opposite the Mansion House on the north side of the highway from Yeovil to Sherborne in occupation of John Daniell. Rent - £74 per annum”. This was John Daniell the younger who had already inherited Hendford House on the death of his father, John Daniell the elder, in 1776. John the Younger was married to Susan, the daughter of Peter Clarke, and they lived in Hendford House until his death in 1819. Susan then moved to West Cowes, Isle of Wight, where she died two years later. Their memorial tablet is in St John's church. In 1812 John purchased Rampisham Manor in Dorset. This was occupied by the Reverend Arthur Johnson who married John's daughter, Elizabeth Clarke Daniell. John Daniell the younger died in Yeovil in 1819 and his daughter Elizabeth inherited his properties, including Hendford House. John Daniell's signature on a banknote issued by the Yeovil Old Bank in 1818 (see Gallery below), the year before his death. The Yeovil Tithe Apportionment of 1846 shows that John Daniell the Younger had extensive land holdings in Yeovil as tabulated below. These were left to his daughter Elizabeth but, of course, in the 1846 Tithe Apportionment her husband was listed as the owner of all the properties. 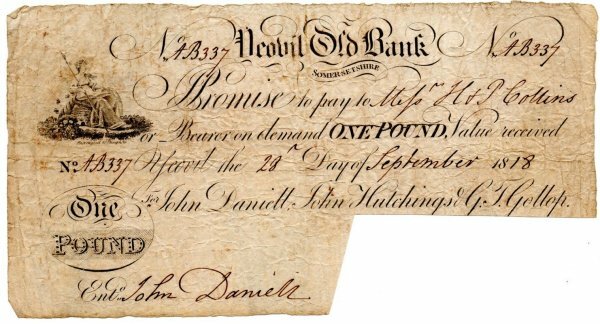 A 'cut-cancelled' banknote for one pound issued by the Yeovil Old Bank and sporting the signature of John Daniell.